Ringo As Churnwalker, you can easily catch Ringo with chains and Torment him closer to your team. Unable to escape, he will be an easy target. Use Ultimate to shut him down briefly if necessary. If Ringo uses Ultimate on your allies, do not use Crucible, let your allies block it, you need to save it for more important situations. Adagio You can engage Captain Adagio easily, as he doesn't deal much damage and has no Escape mechanisms. At some point, he will be forced to activate Ultimate, and that's where Crucible comes in handy. However, Weapon or Crystal Power Adagio can easily punish you for overextending, so be gentle with him. Kestrel Kestrel can't go into Stealth as long as you have her chained. You can Body-Block her Abilities as well, just be careful not to Over extend, because if not Kestrel, at least her Allies will punish you for being aggressive. Taka Just like Kestrel - can't disappear if you have Taka chained. Make sure he doesn't get the lead Early on, to focus. Until 4:00, he will easily get Overpowered if your whole team invades Enemy jungle. In team fights, a single Chain can disable him, but be careful, since he'll easily escape if you don't manage to land it. Otherwise - Taka isn't a major threat. Samuel You can Body-Block Samuel's Malice and Verdict(A) Ability, but only in Emergency situations, cause if you keep taking hits you'll end up giving him free Dragon's Eye stacks. However, you can pull Samuel out of his Drifting Dark, which requires good positioning: Move around the Drifting cloud to land your chain perfectly and pull him out afterwards. But you should get Crucible early for his Ultimate and coordinate with your teammates to affect Samuel most. Flicker Flicker has no protective Abilities to use for emergency, but he can sacrifice himself in order to save his Allies from your chains by standing on the frontline and activating B ability. Keep in mind, that no one can go into Stealth as long as they're under your chains' effect. By chaining all of Flicker's allies, you will deny them to disappear, making his Ultimate useless in Team Fights. Use Tresspass(Ult) to get in a favorable position to land your chains and Torment them afterwards. More tactics can be used, which you will eventually learn by playing Churnwalker. Fortress Just like Flicker, he has no protective Abilities like Ardan's Vanguard(A), or Phinn's Polite Company(B), but that doesn't mean your chains and Torments can't be used defensively: Spread out your chains across Fortress' team to be prepared for their engage, and Torment them all whenever they try to jump on the Backline. However, Fortress can be a great threat if you leave one of your Allies alone. He can rack up some serious damage to a single target along with Allies. Tip: Buying Nullwave Gauntlet will completely deny Fortress' engage: He won' t be able to use items to back up his initiation, dive, invasion, etc. Ardan Ardan is tanky enough to sustain himself on the Frontline, which doesn't make it hard for you to land chains, and use Tresspass to reposition. However, Ardan becomes exceptionally dangerous when it comes to Defense: Vanguard(A) Ability can help him defend his Allies dramatically, and Gauntlet(Ult) can be absolutely devastating if you haven't built Crucible yet. The best way to focus Ardan is by harassing enemies frequently during the Early Game, since that's where Churnwalker's power shines. Koshka Koshka is an incredibly quick Assassin, who can lock down almost any target with Ultimate and burst them down afterwards. As Churnwalker, it would be very hard for you to land chains on her, and even if you do, she can just break it by moving far enough away. But the most frightening part about Koshka is, that you can't do anything to save your allies from her. Your best bet is to Stun her as soon as you land the chain, and let your allies dish out all the necessary damage safely. Skye Skye is also an incredibly mobile hero, who excels at kiting. She can lock you down in unfavorable position in an attempt of landing chains, cause it's easy for her to dodge skillshots. Focus on Early Game when playing against Skye, as she doesn't have enough damage to be deadly during this period. Use body-blocking technique whenever necessary. Alpha Alpha can be deadly if she focuses on a single target throughout the fight, and she's not afraid to turn her attention to a Captain, if everyone else escapes. You can not prevent her from charging in the Backline and eliminating fragile targets, cause your Torment(B) Ability has longer cooldown than any of Alpha's basic Abilities. She becomes weak during the late stages of the game, but not weaker than you. One way to beat Alpha is to create a composition of strong Late Game heroes, and focus her the most. Vox Vox is super effective at concentrating on the Team-Wide damage if played as a CP Carry. He's very slippery, so it's hard to catch him with Chains, and even if you do, Vox will get out of danger easily. If you ever encounter Vox, my advice will be to play safely until you unlock Ultimate, or Overdrive on Chains. Once you do, siege enemy positions aggresively to reach him on the backline and obliterate him. Gwen Gwen is generally a fragile Hero, but her Damage output can suddenly get really high, while she's hard to catch whenever Skedaddle(B) Ability is available. Gwen can be surprisingly dangerous against Churnwalker: Skedaddle could simply break the Chain, which you're pretty much relied on. And reach the safe position quickly. In other words, Gwen can punish anyone in your team for even bothering to hurt her. Churnwalker has been buffed in Update 3.1 for good. His cooldowns and Self-Healing stats has been empowered significantly, which allows Churnwalker back in the meta. Eventually, we will see him more frequently. Healing increased from 12% to 15%. Base Damage increased from 40/80/120/160/240 to 60/110/160/210/310. Cooldown decreased from 70/60/50 to 60/50/40. I strongly recommend watching Churnwalker's spotlight before reading following Chapters(Not if you have already watched it). Churnwalker is a Captain hero, who excels at Area Control and Initiation(Utility). His Ability to Chain multiple enemies to himself is extremely impactful in Team Fights, as he can control Enemy Movement and heal himslef while they're under attack. Churnwalker's power shines during the early Game - he has one of the fastest Jungle Clears of all Captains. His Chains deal considerable amount of Damage over time(+ when hit), while Torment Ability can get enemies in range frequently, as long as the Target is Chained. Most of Churnwalker's team compositions can deal with Stealth heroes(	 Flicker, Taka and Kestrel) - You gain Vision on a target as long as they're chained, which makes Churnwalker a very tough hero to face from a Stealthy hero's side. Churnwalker's Heroic Perk is about Sustain and Team-Wide Damage, which can sometimes help you dramatically on the Frontline, and/or in Team fights as long as you have at least two Chained units. The Heroic Perk is exceptionally useful in the Early Game, where you start by Jungling. 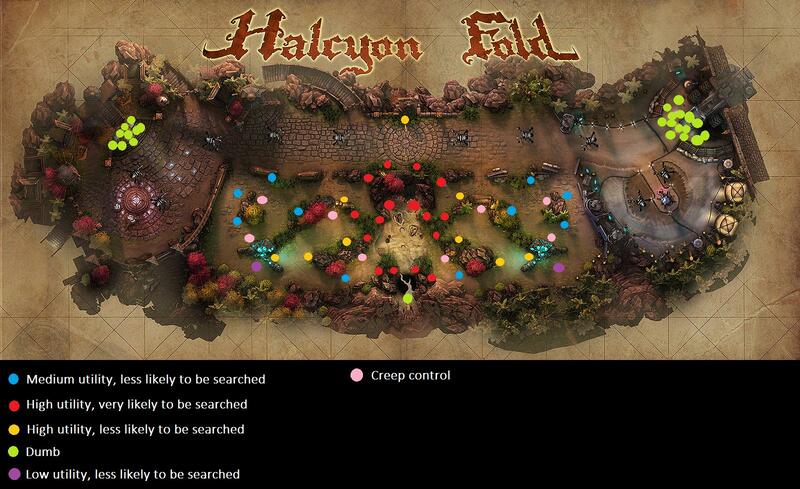 Chain multiple Jungle Camps to share damage between them, this will allow you to clear Jungle and reach Level 2 incredibly quickly, while maintaining your Health, which is very important for early engagements. Perk is also useful in the following stages of the game, but only against Heroes, since Jungle Camps and Objectives become more tanky, and take less Damage. In Team Fights - don't be afraid to stand in a dangerous spot and Chain enemies in order to stay alive and spread Damage. 60% of Churnwalker's Utility comes from this Ability, use it as soon as you see an Enemy Hero anywhere near you - Land your chain and Harass them along with your Teammates to force them out of positions and create space. Keep in mind, that Hook & Chain's Cooldown is reset whenever you land it on target. Other than that, it is the only source of using other Active Abilities(	 Torment and Trespass) as long as you have at least one chained unit, while maintaining Health and dealing considerable Damage with Heroic Perk. Be sure to try chaining all enemy heroes in Team Fights to acquire the most pressure - The more Damage your Teammates do, the longer you stay on the Battlefield, while sharing Damage. Take advantage of Churnwalker's Level 8 Powerspike, where you unlock Overdrive for Hook & Chain: It significantly increases Range, decreases Cooldown speed and Amplifies Damage, meaning, that you can use this Ability more frequently even if you miss. I recommend upgrading this Ability first, and taking it's Overdrive for improved Stats. Skill Skipping:This is a commonly used trick by a professional player FlashX, who plays in Team SoloMid. This trick involves not upgrading your Secondary Ability(	 Torment in this case) to LvL2 when reaching XP Level 5. Because after you reach XP Level 6, you will unlock the Ultimate and gain LvL 4 on your Primary Ability(	 Hook & Chain). This Ability makes approximately 15%-20% of Churnwalker's Utility. All because it is fantastic for pulling Enemies in range for your Allies, which is often extremely important in Team Fights, Jungle Invasions, or else. Torment is also a great Harassing tool, especially during the Laning phase, where you can force Enemy Carry to fall back and allow your Teammate to farm safely. I highly suggest activating it whenever available - This way, you can create opportunities for your Teammates and/or make it easier for them to finish Kills, meanwhile, you can deal substantial Damage. Torment is rarely used for Defense, only because often you don't get to be in a favorable position to yank enemies away from Teammates to allow them to escape. However, when an opportunity is seen, it can be life saving, so pay attention and don't get separated from your Team. I recommend unlocking the Overdrive for Torment for increased Pull range instead of the third rank of the Ultiamte. The Ultimate makes 20-25% of Utility in Churnwalker's Kit, because of it's great amount of uses, but Trespass Ability is mostly used for a Team-Wide Stun, which is hard to predict, therefore, making it an ideal Tool for Engaging, Defending, or probably anything else. Note, that only chained Targets are effected(Including Non-Heroes), and Chains break immediately upon activation. But you can quickly re-Chain them, since the Stunned Target is easier to affect. Plus, Hook & Chain's Cooldown resets anytime you land it - Use this to your Advantage. Help your fleeing Ally escape by trespassing in a position between him/her and the Enemy, and tank all the damage afterwards for a great escape. I recommend skipping the last Rank of the Ultimate to get both Overdrives, but consider maxing it if you need Stuns frequently. Captain heroes in Vainglory are usually Helping Teammates and Controlling Vision throughout the Game, in order to guide them into the Battle and achieve Victory. Captains aren't meant to deal Damage in the Battles, but to help Allies instead, where certain items(	 Fountain of Renewal, Crucible, War Treads, etc.) come in very handy, and are required to have. For the best results, you must purchase them along with the Vision items, to constantly rotate around the map safely, or to be aware of enemy movements and Objective statuses. Other than that, they're extremely useful in team Fights and emergency situations. As a Captain, you often shouldn't Farm, unless it's an emergency or a Jungle Invade. All the Farm has to go to your Teammates, while you assist them. Churnwalker is very quick at clearing Jungle Camps along with Teammates, mainly because you can Chain them all together and share substantial Damage, while sustaining yourself. Take the most hits from the Jungle Camps to let your Jungler Farm safely, but you should be careful not to land any Killing Blows - for the same reason. Since your Role isn't Jungler, you should feel free to go around and establish Vision in the Jungle to be aware of Aggressive Enemy Rotations. This map shows different positions for Scout Traps. Take advantage of your great Power to control the lane, where space is very limited - Chain Enemy Heroes and help your Allies to get in Range with Torment, after which, you can Damage them safely. This trick usually forces Enemies to fall back to a safe position, allowing you to create space, which your Allies could benefit from, if you're playing Defensively. If not, I would suggest Tormenting Enemies aggresively and going for Kills, which can get your Carry ahead in Gold. Use Hook & Chain Ability as frequently as possible, to Chain all enemies together and let your Teammates deal Damage, Sustaining yourself in the process. The Damage share and Healing from the Perk is very important aspect of Churnwalker - it is one of the few things, that help him on the Frontline, so be sure not to worry about yourself most of the times, and just help Allies focus. For Enemies, it is sometimes very Annoying to be pulled towards your location and be dealt with ease. Their Disadvantage is your Advantage - harass them even in Team Fights to force them out, or into your Range. Before using Ultimate, you must securely Chain the highest Priority targets, after which, you can Stun them to buy your Allies time to react. Powerspikes are very important aspects of every Hero, it's when you unlock an important Ability, or Item for the first time, that can be very impactful for Engagements. Churnwalker's Powerspikes are very powerful at times, and to use it, you need good timing, since it could be too early, or too late to use them to your advantage. First III item - Fountain of Renewal purchased. I highly suggest engaging the Enemy Team aggressively once you gain these Powerspikes before they do. Churnwalker's Team compositions are mostly focused on dominating Early Game, since he has such a strong start with decent Damage output and Sustain. Focus on Ganking and Invading Enemies frequently to get the most results, after which, you'll be able to Snowball the Game. It's often very hard to play without the right Team Composition against Enemies, especially if they have most Synergies. Synergies between Heroes explain how well they go along each other in Battle - Stronger Synergy leads to a stronger Team Composition, while weak Synergy leads to a regular Team Composition. It's always better to have a strong Composition against Enemies to have a higher chance of defeating them. I'll give you few examples of Churnwalker's Synergies below. WINNING CONDITION: Dominate the Early Game, Snowball afterwards. Reim needs to get in Range and stick to his target to apply the most pressure, which is often hard for him, especially when he's alone. Churnwalker's Torment and Trespass Abilities are perfect to help Reim stay on the Battlefield - Yank Enemies as frequently as possible, this dramatically increases chance for the target to be hit with Winter Spire, or Valkyrie, which is the first step of dominating the Battle. Trespass on the other hand, can Stun either all the Enemies, or a single target for Reim to reach easily. Other than that, you're both very Tanky to stay on the Frontline, and protect the Carry from incoming Damage. WINNING CONDITION: Just focus on Early Game(Gank, Invade). Rona's Red Mist Ability has one of the best Synergies with Churnwalker you'll ever see: When she activates it, you can yank all chained Enemies inside the whirlwind range and deal immense amounts of Damage. If Rona builds Life Steal items, she can stay healthy for longer duration along with you, since your Perk naturally heals you whenever Chained Enemies take damage. If she focuses on a single Target, Rona can still deal substantial Damage to the whole Enemy team as long as you have them under your Chains' effect. Always play aggressively with Rona, dominate the Jungle in the Early Game and try to apply as much pressure to fragile Targets as possible. WINNING CONDITION: Snowball the Game by ganking Enemies frequently, especially in the Early Game. Glaive is one of the best heroes for Ganking: His Afterburn Ability can devastate an Enemy carry if used properly, which isn't hard. But sometimes Glaive's targets might survive with quick reactions, or help of their Captains. Churnwalker and Glaive can perform inevitable Ganks together in a matter of seconds - Afterburn can deal significant Damage and knock the Target into the Turret Range, while Torment guarantees, that Target will stay in Range for upcoming Attacks. This is an ideal way to get ahead in Gold and Snowball the Game Early on, so if Glaive is on your side, try to Gank as hard as possible. His Critical Strikes can also be devastating to all the Chained Enemies, while Trespass Ability can lock down and Expose enemies to the most frightening Attacks. WINNING CONDITION: Play safely until Adagio has enough power. Focus on Team Fights afterwards. Adagio and Churnwalker can cause serious trouble to many Team Compositions. Both of them can perform a Team-Wide Stun with Ultimates(	 Verse of Judgement; Trespass) one after another, which is often almost impossible to avoid if enemies don't purchase Crucible very early, and even if they do, it can't be used twice to block both of the devastating Abilities, therefore, making Adagio and Churnwalker have a very frightening Synergy. If Adagio is about drop the Ultimate, stand near him and yank all the Enemies, that try to run out of the circle to land a guaranteed Stun. Adagio can also benefit from your tankiness - you can stand on the Frontline and fearlessly tank Damage, while he heals you and spreads Arcane Fire across the Enemy Team to apply the most pressure and regenerate Energy. Verse of Judgement - You need to light up all the enemies with Arcane Fire in order to Stun them. WINNING CONDITION: Focus on the Fronline, while Ringo collects enough farm to become powerful. Ringo is an example of low Synergy level with Churnwalker. He needs extra protection to afford necessary items, in order to deal the most Damage for the Team. Since churnalker doesn't have any Defensive Abilities, Ringo will most likely be almost defenseless, and exposed to the Enemy ganks. Your best bet is to dominate the Jungle, and try your best to snowball the Game. With enough Gold Lead, Ringo can afford powerful items to become an absolute menace in the Lane. At this point, he will have enough power to punish the Enemies, that try to reach him. But the problem is, that this is incredibly risky and difficult. Any Hero in the Game can benefit from items, but it depends on the Hero itself, and item builds. Different item builds provide different Playstyles and Strategies for each Role and each Hero. For this example, I'll cover the basic item explanations for Captain builds, to let you decide what to buy and when. Every Captain Hero has 3 Core items. These items are crucial, since they have Team-Wide effects and are useful for certain situations. As a Captain, you must always prioritize Core items before anything else. Fountain should always be your first Tier III item, no matter what. Only because of it's Ability to Heal nearby Allies, which is extremely useful in Team Fights, Turret dives, or Emergency situations. Note, that it Heals more, if target's Health is low, so sometimes it can be Life Saving in very close situations. Take advantage of it's passive stats, it is the only source of Shield(+75 Shield; +30 Armor.) for a Captain! Purchasing Fountain of Renewal earlier than Enemy Captain will most likely give you a significant Advantage in the next Team Fight, since you will be able to Heal your Team, unlike them. Crucible is the single most useful item after Fountain of Renewal, it grants Reflex Block to every nearby Ally when activated, therefore, making it absolutely necessary against Heroes with strong AOE Ultimates, like Verse of Judgement, Oblivion, or Blast Tremor. If there are no such Heroes in the Enemy Team, that doesn't mean you shouldn't purchase this item, since nothing makes you Tankier than crucilbe does(+700 HP). Crucible can be extremely useful in Team Fights, since it can completely Negate AOE Abilities, but be careful before using: You might Activate Crucible either Too Early, or Too Late when you're not patient. This item is most commonly purchased after you build previous Core items, since it's stats(+500 HP) are less significant along with the Active Ability to grant sprint to all nearby Allies. However, War Treads can be very useful for Engaging, or Retreating from the Battle, which is very important, especially in the Late Game. You don't necessarily need good timing, or positioning when using this item, but still, try to be patient with it, because of long Cooldown. Prioritize War Treads early, if your Team is getting kited easily, then build Crucible immediately. Some Utility items are very situational, and can't be built in any case, but they come in very handy, and will eventually change the way of the Battle, when purchased at the right time. This item is very effective at Backing Up, or Denying engages, and is not necessarily hard to use. Silence an Enemy Captain to deny their Defensive items and Resistances, while allowing your Team to safely Engage. Sometimes it's even more effective when playing against an Aggressive Composition. Once again, you'll be able to Silence Enemy Captain's items and make sure, that they won't retreat, this will most likely help you turn the desired Team Fight around and bring you a step-closer to winning it. You can also silence enemy an Carry, or Jungler to make sure they don't escape with Boots, or negate CC with Reflex Block. Very effective when combined with Torment - Yank Enemies towards you, and activate Shiversteel immediately to keep them in Range and make sure they don't break Chains by going too far away. Shiversteel is exceptionally useful when you have Heroes, like Krul, or Reim in your Team, since they need to stick to their Target, in order to apply the most pressure possible. It also depends on Enemy Heroes. For example, when they have Heroes, that are good at kiting - You can slow them down to make sure they don't get far away from your Team's Range. Other than that, Shiversteel makes you Tanky(+500 HP) and significantly increases your Attack Speed(+25% Attack Speed). I strongly recommend avoiding to build Stormcrown at any cost. It is NOT a Captain's item, in which many people believe. Because it doesn't help your Team in any way. However, there could be times, where you can possibly purchase Stormcrown, like when you find a significant advantage in Overall Gold and decide to play Aggressively, or if you want to increase Total Damage your Team is dealing. Though, it's main use is to help you push Lane and/or safely secure Objectives. Defense items are relatively cheap, yet important in Dangerous scenarios. Usually, they're purhcased when Team's Defense stats are low, or if they want to be protected from certain Heroes, especially Assassins. Captain Heroes usually stick with Core items, as they're just enough to avoid lethal Damage most of the times. But extra Defense can sometimes help you stay more healthy on the Frontline, or negate Enemy pressure. This item is very rarely purchased, because sometimes bonus Health(+500 HP) is just not enough to reduce Enemy Damage. If an Enemy Team has an Assassin like Taka, or Koshka, than Slumbering Husk won't be completely useless, as it can help you avoid high Burst Damage. As Churnwalker, should you often avoid building Slumbering Husk, but not if you need to spend most of the time on the Frontline. It's synergy with your Perk can keep you alive for dramatically increased duration. This item is mostly known for effectiveness against Attack Speed based Compositions, as it can completely deny Enemy pressure, especially when there are Heroes like Krul, SAW, or Rona. Atlas Pauldron's passive stats aren't that important, or useful in most scenarios, so try to affect the Priority Target with a lot of patience. I would suggest purchasing it against Attack Speed based Heroes, but only after completing to build at least 2 Core items. Learn which build are you aiming for, based on your actions. A basic Captain build. Works against many Team Compositions most of the times, as long as your Team is active. Use your items carefully, since all of them have active components and different Cooldown times. Very situational and risky build. You should follow this path only if you're expecting good Early Game results, and if your Team is okay with it. Choose items very carefully - some of them might be very useless at times, but with right decisions, you'll be able to snowball the game very easily, which is one of your top priorities. On top of all, this build is focused on "increased" Team Utility: High aggression allows you and your Teammates to affect Enemies more easily. The best way to master Churnwalker is by practice - play him frequently in Casual, or sometimes Ranked matches, so you get to know about his characteristics better develop your own Strategies, and make it feel like he's "Your Hero". This chapter covers the basics of In-Game stages, that are very important for bringing you a Step-Closer to securing the Game. At the Start, I strongly recommend purchasing Oakheart and Ironguard Contract for fast, healthy Jungle Clear and good performance in Early Engagements. Lead your Team to the center of the Jungle and try to defeat the Elder Treant for very significant Gold advantage(Up to +120 Gold) and a Buff. If you, or your Teammates manage to get it, I suggest engaging for the First Blood and Stealing as many Jungle Camps from Enemies as possible. This way, you'll get the Gold Lead you need to allow you to Snowball the Game afterwards. This is a commonly used trick in eSports Games, used by Professional Players. It involves Every Hero of your team to step forward, and tank Damage, then immediately retreat one after another, while you focus only on one Target in the Enemy Team. This way, your Team should end up dishing out the most Damage possible from the Backlines, while Enemies will have no choice, but to focus on the closest Target. Once you reach Level 2 by helping your Jungler with another Jungle rotation, the best thing to do is to go up in the Lane, and protect your Carry to allow them to farm safely. Siege the Lane positions by Chaining Enemies and Harassing them. Your Damage output is often very impressive in the Early Game - Use this to your Advantage. However, if your Carry feels more confident, and likes to sit in the Lane all alone, you can help your Jungler instead. Invade Enemies in the Jungle as frequently as possible, and steal their Camps whenever an opportunity is seen. Nothing is more important than XP for the Jungler. Once you are ready, feel free to go for quick, easy Ganks on the Lane to push Enemies back and increase Overall Gold collected by your Team. At exactly 4 Minutes, where you collect approximately 2000 Gold, the Jungle Shop will spawn on Elder Treant's location. As a Captain, your first Tier III item should always be Fountain of Renewal, no matter what. It helps you survive very close situations dramatically, therefore it is the single most important item in the Captain's Core Build. For Vision, I recommend frequently purchasing Flares and Scout Traps, never go for an early Contraption, even if Enemies have Stealth Heroes. Because, as I've already mentioned, they can't disappear unless they break your Chains, so all you need is patience, to land Chains and make sure the Enemies don't get away. Somewhere around 5 minutes, you'll reach Level 6, where you unlock the biggest powerspike - Trespass. Make sure you don't miss it. All you need is careful timing and coordination to unleash a massive Team-Wide stun, that can buy your Allies time deal most Damage. Always encourage your Allies to farm as much as possible, Gold Lead is very important for most of Churnwalker's compositions, especially in this stage of the Game. Don't forget to build a second Core item before 7 Minutes. It can be either War Treads, or Crucible. Both of which depend on the performance of your Team - If you're playing Defensively, or if Enemies have Ton of CC, go for Crucible. If you're frequently engaging Enemies with ease, or if your Team is getting kited easily, I recommend getting War Treads first. Mid Game is not equally important for you, as Churnwalker, especially because most of your Damage falls off the board, which takes away Ganking and Invade potential, leaving you with only Area Control and Utility. That's why you should focus on Early Game, and try to get as much Lead as possible. After 8 Minutes, your Allies should be able to get their hands on at least 2 Tier III items, that are predictably important for most scenarios during the Mid Game, where some of the earlier Team Fights usually occur. Performance in these Team Fights depend on your entire Team, and your Playstyle. That's why everyone should get ready before initiating. Always try to Chain all Enemy Heroes before using an Ultimate(Emergency otherwise) to get the best results possible, which your Allies could benefit from. Check out the "Playstyle & Mechanics" Chapter above, to learn about the Team Fights(Not if you've already seen it). One of the most important parts of the Mid Game is the Gold Miner. It gives a significant XP and Overall Gold boost to your entire Team when defeated. The key to secure the Miner is to do it quickly, without Enemies noticing. Gold Miner spawns at 4:00 minute mark in the middle of the map along with the Jungle Shop and Crystal Miner and starts collecting Gold as soon as it arrives. Defeating the Gold Miner rewards the whole Team with as many Gold as it has collected(Up to +400 Gold for each player). Gold Miner collects it's maximum amount of Gold at around 8:00 minutes. Make sure you're always ready to take advantage of it when Enemies aren't around, or if you achieve an Ace. 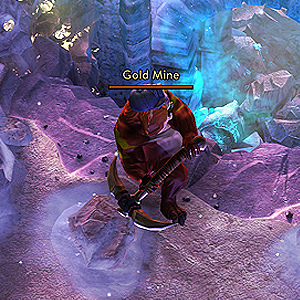 Control the Gold miner's vision to be aware if Enemies are wiling to take it whenever you're not nearby. Captain(You) - Either help your Carry, or Jungler. Splitting Objectives in such way can help you get ahead in one Ace, which will help you hold Enemies back. Itemization depends on Enemy Team Compositions most of the time. You should always try to react properly to Enemy Item builds and characteristics, which your Allies could benefit from. For example, if Enemies have dangerous AOE Ultimates, you must build the Crucible, but if they don't, you could prioritize other Core items such as War Treads first. Remember, all Core items are equally important for any Captain Hero, as they grant Team-Wide effects, and make up for what you miss with Utility. Keep this item in your inventory until the moment comes, where you don't need it anymore, which is usually in the Late Game - when you finish building your Core items. It can be very useful in Team Fights and close situations, as it allows you to absorb incoming Damage and restore some of your Health and Energy. Make sure you use the Healing Flask one last time before selling it to get the most Utility. High Team Fight potential(Area Control). The Late Game is quite difficult for Churnwalker sometimes, since it all depends on earlier stages of the Game. But if performed right, you'll find a very favorable advantage, that will most likely negate Enemy forces and help you maintain the pressure. You'll spend most of the time rotating around the map with your Teammates at this stage, looking for a perfect moment and place to initiate a fight. Player(s) missing - Easily eliminate outnumbered Enemy Heroes. The Kraken replaces the Gold Miner at 15:00 minute mark and stays until the end of the Game. Capturing the Kraken may require your full Team, since she is incredibly tanky and her attacks deal huge Damage. Upon capturing, the Kraken will go up on the Lane, and start pushing turrets. No Gold bounty is achieved when killed, which makes Kraken a very significant Objective. The Kraken is one of the most valuable Objectives in the entire Game. Basically, the Team, which manages to capture her, will have a very powerful advantage in Turret numbers. However, if Enemies manage to unleash the Kraken first, your Team must defend Turrets at all costs and avoid further threats by playing safely for a while. Don't get confused in Team Fights. This is one of the worst things to do in the Late Game, so stay focused. Coordinate with your Team to set up ambushes, in order to catch enemies off guard - just when they're not expecting. This is a single most important thing in the Late Game, since there's nothing more left to do, both Teams will start fighting each other until one of them wins the Game. You'll be seeing a lot of Team Fights at this point, so you need to be prepared. As soon as the Fight begins, you need to land at least two Chains properly, and start coordinating with your Allies around the Enemy Team to limit their movement and make sure they don't break your Chains. Because if they do, you will have to start all over. Remember, that your Chains are your main source of Utility in Team Fights. The more chained Targets you have, the more Damage they're dealt and more health you gain, so always aim for every visible Target when throwing Chains and get your Team to do the rest. If enemies seem to be getting away frequently, just activate your Torment Ability to yank them inside your Team's Attack Range. If you just want to spice things up, activate Trespass upon chaining all, or at least Top Priority Targets and buy your Team time to either escape, or deal extra Damage safely. Since all the Chains brake upon activating the Ultimate, you can use the time to re-chain enemies and keep coordinating with your team. Atlas Pauldron - This item affects target(s) for 4 seconds, and is pretty tricky to land, while it has a 20 second cooldown. When playing against Attack Speed reliant compositions, your Team basically relies on Atlas, so it's a big responsibility for you to affect Enemies properly. Shiversteel(If purchased) - If you decide to allow your Team to catch up on Enemies more easily, you'll most likely purchase this item, but don't underestimate the responsibility, that comes with it. Before activating, make sure you're in range with Enemies to constantly attack them, or you'll be left with a 20 second cooldown, which basically indicates, that Shiversteel is "wasted". I couldn't resist adding another "Team Fights" Section in this part. I mean, it's Late Game! The most important thing is to understand the Team Fight logic..! ...This was XapocaliptusX, thanks for reading my guide, I highly appreciate it. My top priority was to share my information with all the readers, so I hope you enjoyed it. If there's an inaccurate aspect to this guide, that is bothering you, or if you'd suggest adding something new to it, feel free to ask me through messages, or write a comment about it. I will try my best not to leave them unnoticed. Thanks again for your attention, have a nice day.